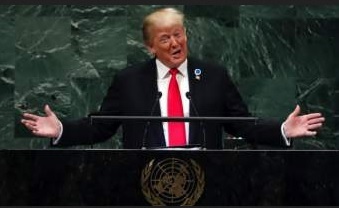 In his second speech to the United Nations, President Donald Trump delivered a stinging rebuke to globalism and global governance, calling on responsible nations everywhere to defend their national sovereignty from all attacks. The U.S. president also ridiculed key globalist institutions such as the disgraced UN Human Rights Council and the Orwellian International Criminal Court. Instead of globalism, Trump called for patriotism. Instead of global governance, he touted unique nations protecting their own cultures, traditions, and sovereignty. Obviously, the globalists and tyrants in the room were not amused. Some even laughed out loud, literally. But if Trump plays his cards right, he and the American people will have the last laugh. We only ask that you honor our sovereignty in return, he said. The U.S. president also lambasted the self-styled International Criminal Court, saying the U.S. government would provide no support or recognition to the body. As far as America is concerned, the ICC has no jurisdiction, no legitimacy, and no authority, he said. The ICC claims near-universal jurisdiction over the citizens of every country, violating all principles of justice, fairness, and due process. We will never surrender Americas sovereignty to an unelected, unaccountable, global bureaucracy. The U.S. government has never ratified the agreements creating the global kangaroo court, and yet it continues to pretend like it can put Americans on trial. In recent weeks, the administration warned that any effort to prosecute an American in the discredited court would be met with firm resistance, including criminal prosecution and sanctions against all involved. Going a step further, the president blasted some of the crucial mechanisms used by the Deep State to advance its globalist agenda. On the mass importation of Islamic immigrants into the West by the UN under the guise of humanitarianism, for example, Trump highlighted an alternative long touted by genuine humanitarians and critics of open borders. I commend the people of Jordan and other neighboring countries for hosting refugees from this very brutal civil war, Trump said, referring to the ongoing war in Syria. As we see in Jordan, the most compassionate policy is to place refugees as close to their homes as possible to ease their eventual return to be part of the rebuilding process. This approach also stretches finite resources to help far more people, increasing the impact of every dollar spent. Estimates suggest it costs 20 to 50 times more to re-settle a refugee in America or Western Europe than to keep him or her close by. On trade policy, Trump vowed that globalist free trade agreements would no longer be allowed to continue facilitating the looting of America. Blasting discredited ideologies, Trump said America would support fair and reciprocal trade. The United States will not be taken advantage of any longer, he warned assembled government leaders. For decades, the United States opened its economy  the largest, by far, on Earth  with few conditions.... Yet, other countries did not grant us fair and reciprocal access to their markets in return. Even worse, some countries abused their openness to dump their products, subsidize their goods, target our industries, and manipulate their currencies to gain unfair advantage over our country. As a result, our trade deficit ballooned to nearly $800 billion a year. For this reason, we are systematically renegotiating broken and bad trade deals. He touted the new U.S.-Mexico trade deal and the South Korea-U.S. deal as examples. But those days are over, Trump said. We will no longer tolerate such abuse. We will not allow our workers to be victimized, our companies to be cheated, and our wealth to be plundered and transferred. America will never apologize for protecting its citizens. As part of that, Trump spoke of massive new tariffs he is imposing on Chinese imports, saying, Chinas market distortions and the way they deal cannot be tolerated. Among the measures being implemented are stronger controls over threats to national security from foreign investment in sensitive industries and sectors. In recent months, Trump has also threatened to blow up the architecture of globalist free trade, too, although so far those threats have not materialized in reality. However, for whatever reason, the president also gave several subtle nods to globalism. For instance, he spoke of working with the "Gulf Cooperation Council," an emerging European Union-style regime on the Arabian peninsula that fits neatly into the Henry New World Order Kissinger vision of globalist regional governments merging into a global order. Trump also praised the alleged UN work that supposedly helps people build better lives, as if other organizations or churches could not do far better for a fraction of the cost. But despite that, Trump vowed to keep working to change the way UN contributions are assessed. He said he would work toward a voluntary system of contributions rather than assessed ones so that the U.S. government can target American resources to the programs with the best record of success. He did not specify which programs those might be. Obviously, globalists everywhere  especially within the establishment media and the within the globalist institutions of global governance at the UN and beyond  were furious with the speech. Some could barely contain their rage. Others acted as if it was a joke, with some attendees at the speech actually laughing when Trump touted his administration's accomplishments. But regardless of what globalists and the establishment want, elections and opinion polls around the world show that patriotism is rising as globalism becomes increasingly toxic and discredited with the people. Americans and all those who value liberty must remain active to build on the momentum. Alex Newman, a foreign correspondent for The New American, is based in Europe but has lived all over the world. Follow him on Twitter @ALEXNEWMAN_JOU or on Facebook. He can be reached at anewman@thenewamerican.com. United Nations Exploits Pseudo-Human Rights to Attack U.S.